"At 11AM they brought in my means for food and hydration for the remainder of the day..."
Last week was spent in the hospital. In Japanese they call it 入院 (nyuin). Last Monday, on the 5th, I went to the hospital in Kumamoto and checked myself in. It was 10:30 am in the morning and I didn’t have surgery planned until the next day. I was unhappy and a little short-fused because instead of working I had to sit in a hospital the entire day–a hospital I could not leave after checking in; and what would I do? I checked myself in and they brought me to the 7th floor of the hospital. At that point they took me to my room which I shared with 7 other people with their own ailments. I thought, “Great–no privacy either…” I expected to have a roommate, but I guess I never thought, in my wildest imagination, that I would be sharing a room with 7 other people. Astonishingly, every person who came to visit me was surprised as well. However, it was a big hospital, and popular. I suppose, because of that, it is to be expected. Throughout my first day I was visited by random people who began scared out of their wits to attempt to speak to me. I’m a foreigner, remember? Their assumption is that I don’t speak a lick of Japanese, let alone understand a word of it. I may not be fluent, but I know enough to get myself through the day and survive until the next without little to no help. They had me come in early, I found out, to explain to my what the following day would entail. I was visited by three people: a nurse, the surgeons assistant and my doctor; so you could say that I was waiting to be visited by the three ghosts of Surgery and Hospitalization. The day of my surgery they woke everyone up at 6am. They took my blood pressure and my temperature–I was in tiptop shape. My student nurse was concerned about my bowel movements as I admitted that I did not know when the last time I did #2 (she asked!). I tried to explain to her that, for me, it’s totally normal and typical, but she still asked me once every hour or so when she had to check up on me. "When I asked why there was a tube sticking out of my hand they told me it was placed under the tendon so it wouldn't stick again..."
At 7:30am I ate before everyone else in my room because at 8 I was to stop drinking fluids or eating food. 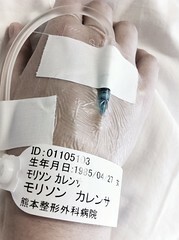 Afterward I putzed around for a few hours until 11:00am when the nurse came in with my scheduled IV (点滴 [tenteki]). My surgery was scheduled at 3:30pm, so there was plenty of time for me to contemplate my fears and lament for the events to come. My neighbor told me not to worry and insisted it didn’t hurt. She explained to me that they play music during the surgery to help relax you and that it’ll be over before I know it. I appreciated her support, but it didn’t ease my tension at all. It was hard to forget or push out the thoughts going through my head when I had the IV sticking in my hand. A constant reminder of what was to come. 3:20 rolled around and everyone came into my room to prep me. It felt like a huge ritual–so many people surrounding me and my bed as though I was going to make a break for it. They had me lay down on my bed and they wheeled me out of the room. The wait for the elevator felt like forever, and when we made it to the 3rd floor. They pushed my bed in front of a door that read 手術室 (shujutsushitsu) and I knew it was the operating room. They waved us in and I was switched to the operating table which was much more narrow than my bed–which I might add I thought was also a little narrow). The shots were the worst part. There were many shots for the local anesthesia. It took forever for my hand to take it as well. The original 2 shots turned into 5 or so. Eventually I couldn’t feel my hand anymore and the surgery could begin. But while they were waiting, I remember feeling sick to my stomach because my hand was tingling and it felt disgusting as it was losing sensation. My doctor rubbed it and massaged the muscle to spread out the solution from the shot, which was made me feel sick. I almost thought I was going to throw up. I could feel it, but I couldn’t feel it. 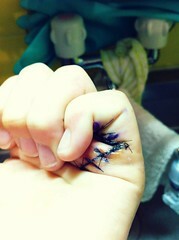 After they reached the tendon they asked me to make a fist with my hand. I tried to make a fist, unknowing if I was actually doing it. I couldn’t feel my hand so I had no idea if I was succeeding in my attempt. I heard responses of happiness from behind the little curtain they put up so I couldn’t see the surgery happen. But at that moment my doctor told me he wanted me to look at my hand, to which I replied I didn’t want to (見たくない). He told me to bare with it because I had to look to verify there was movement. So yes, I saw my own tendon. It wasn’t until the following day that they took the bandages off and I was able to see my hand after the surgery. 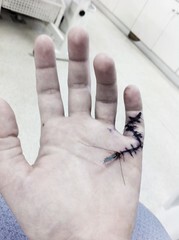 There was a black train-track-like drawing on my hand to help with the stitches and a tube. When I asked why there was a tube (管) sticking out of my hand they explained so that blood could leak. It was placed under the tendon so that it couldn’t stick itself back to the bone, causing the surgery to be pointless. "It always feels tired and exhausted from all of the physical therapy..."
All said and done, I can move my finger again and I’m regaining movement in my ring finger as well since I couldn’t move that to the degree it normally could because the pinkie wouldn’t move. I have to go to Physical Therapy (the Japanese say “rehab”) every day to help regain more movement. I have to be careful because soon the tendon will try to stick again. At home I must practice using my hand a lot–I was also given permission to ride my bike in my current condition because it is good for physical therapy (the squeezing for the break). The truth is, my hand is weak. I cannot squeeze as hard as my other hand and my hand constantly feels like it’s tired from all the “working out” it’s been doing. I haven’t used my tendon since late May, to be honest, and it’s only natural that it feel tired and exhausted after using it. I will say that I enjoy my physical therapy. It may hurt, but it helps loosen the muscles that tense up throughout the day. I don’t have enough hands to do what the people at physical therapy do, so it’s really helpful. I always walk away with more mobility than I walk in with–of course until the tendon gains it’s strength back it’ll be hard for that mobility to stick around. I will never be able to curl my pinkie as much as my right hand. My first doctor who I saw when I first broke my hand really didn’t handle the situation well. He did not listen to my concerns when I stated that I felt something else was wrong with my hand, besides the broken bone. He did not refer me to another doctor and, ultimately, in the end, he did not even correctly set the bone. He buddy-taped it to my ring finger and added some hard thing to the palm of my hand to support my pinkie but he never set the bone–as a result I have a 30 degree bend in my pinkie finger which will always cause the defect you see in the above picture. HIT me, baby. One more time.